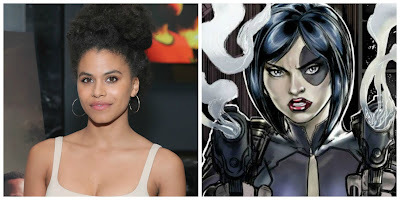 THR is reporting Atlanta break-out Zazie Beets will play Domino in the upcoming Deadpool sequel. Deadpool himself, Ryan Reynolds, made the announcement via Twitter, with the caption "domino effect". In Marvel's comic book mythology, Domino is a mercenary who mostly works on the side of the good guys. Debuting in the same issue as Deadpool himself (1991's New Mutants No. 98), she is another survivor of a government program to create the ultimate soldier. Instead of adamantium claws or hyper-active healing powers, she can affect probability itself, creating "good luck" for herself and those around her — something she's put to use serving alongside Cable, another fan-favorite X-character who'll be showing up in the new movie, but has yet to be cast. Producers were looking to specifically cast a black or latina actress in the role of Domino, testing a variety of actresses but have appeared to land on Beetz. Deadpool 2 will be directed by John Wick filmmaker David Leitch, with original Deadpool scripters Rhett Reese and Paul Wernick returning the pen the follow-up for Fox, along with The Martian writer Drew Goddard. Simon Kinberg, Lauren Shuler Donner and Reynolds are set to produce. After its February 2016 release, Deadpool became a run-away hit (and a surprise awards contender), grossing more than $780 million at the global box office, prompting the studio to expedite production on a sequel. Beets plays Van in the Donald Glover's award-winning FX series, where she has emerged as a fan favorite. She will soon be seen in Chance the Rapper's horror-comedy Slice.